I guess we all are getting older each day, but I’ve been thinking about age lately. And I must give credit to Kurt Busiek and his current Astro City storyline for making me do so. Astro City 18-21 features the tale of some heroes who are dealing with getting old. I am old enough that I started reading comic books back in the 70’s. I never thought about the heroes I was reading about getting old. I eventually picked up that DC comics had characters that had been around since the 40’s and hadn’t aged at all. Marvel’s heroes originally aged at a regular pace, but that aging stopped around the beginning of the 70’s. There have been some time-travel or non-continuity stories that involve the regular characters being older, but there aren’t any significant changes associated with age. Astro City, however, takes place in real time. Stories are dated, and many tales have been flashbacks or period pieces about the history of the Astro City world. This allows Kurt to explore what happens as time goes by for the characters. 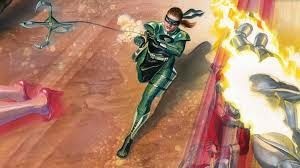 In this case, the story revolves around a couple of heroes, Quarrel and Crackerjack, with no special powers who have relied on their acrobatic abilities and some gadgets to fight super-villains. Now they are getting older and slower. I can relate. I’m not a super-acrobat, but I really do feel less able than I used to, and though I don’t whine about getting older, I am aware that it changes things. I think the characters are in a situation similar to an athlete who can no longer compete on a professional level and now has to decide what to do with his life. Astro City has always been a very character-driven series, and the exploration of the two main characters of this arc and their relationship is extremely engaging to me. It’s about getting old, but it’s also about the trials and triumphs these characters have experienced on their journey. I’ve just finished issue 20, and I’m eager to find out how it all ends. I just hope Quarrel and Crackerjack will have a happy ending. And then we can check back on them later and see how they are doing again! I just wanted to post some recent sketches this week and mention I have 2 conventions appearances scheduled for this spring: SPACE in Columbus April 11 & 12 and Motor City Comic Con in Novi, Michigan on May 15-17! Hope to see you there! Kate Conway is a talented award-winning actress from Canada. She is the star of the webseries Out With Dad. And she is the co-writer of the episode “Out After Dark” that I had the pleasure of drawing as a comic. She has now released a new series wherein she admits to being a jerk. I think it is rather brave of Kate to come out and admit that she is a jerk. I know some people who are jerks, and they seem to have the same problems: 1) they do not know they are jerks or 2) they do not admit they are jerks. So, hats off to Kate for being honest. I don’t think she’s really a jerk. The first episode really does make her look like a bit of an unkind person, I’ll admit. I, however, believe it’s all an act. The way I see it, if Kate is such a great actress that she’s won all these awards, she would be ACTING like a jerk, and not really be a jerk at all. Make sense, doesn’t it? In fact, there’s probably no way we have of knowing what kind of person she is, because any way she acts could be…acting! Thinking about it just boggles the mind! Maybe she’s nice, or mean, or apathetic, or maybe she’s not even Canadian and just acts like one! But my point is, the show is very funny. I’ve gotten a few people to watch it and they thought it was funny. So everyone else should watch it and then think it is funny, too! If you don’t, you’re kind of being a jerk.